"I hear you lost your swing. I guess we got to go find it." What drives us to compete so fiercely in sports? Is it a simple need for recognition, or is it something deeper within our souls? Sports are often used as a metaphor for life, and this particularly applies to golf. In this game, there is no true opponent, and success or failure resides totally within each individual. Each person must strive to find the "authentic swing" to master the obstacles on the course. Based on the novel by Steven Pressfield, Robert Redford's The Legend of Bagger Vance takes a spiritual journey through the mind of golfer Rannulph Junuh (Matt Damon) in his quest to recapture the energy of his early life. In his younger days, he was a spectacular golfer, had a beautiful girlfriend, and was the toast of the town. Shattered by the mind-numbing horror of World War I, Junuh spends his time drinking and trying to forget his horrible experiences. He's "lost his swing" in golf and in life, and little hope exists for this broken man. 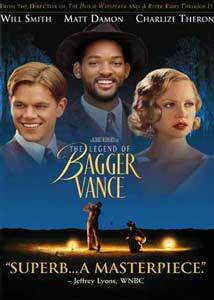 When the mysterious Bagger Vance (Will Smith) arrives, he brings Junuh a chance at redemption. If he rediscovers his love of golf, perhaps he can once again develop the courage to live his life. Robert Redford (A River Runs Through It, The Horse Whisperer) excels in directing human dramas that unfold against picturesque natural landscapes. His films avoid the bustling, crowded cities of today's world and yearn nostalgically for the simpler life of the past. The stories develop slowly within beautiful, vast, nearly empty scenery, and the fresh greens, calm waters, and pristine bunkers of the golf course are the perfect setting for Junuh's low-key story. The Savannah of the late 1920s retains the small-town feel appropriate to Redford's thoughtful direction. He avoids the quick-cutting, fast-paced approach common to many of today's prominent young directors and takes a leisurely, sentimental approach to this story. The centerpiece of the story is an epic exhibition golf match between Junuh and two world-famous professionals—all-American Bobby Jones (Joel Gretsch) and the eccentric, womanizing Walter Hagen (Bruce McGill). While he tries to save his faltering golf game, Junuh must also deal with his feelings for past love Adele Invergordon (Charlize Theron). Even as the competition rages on, the "sports film" becomes a more spiritual meditation on golf and life. With Bagger's assistance, Junuh struggles to find his true focus and regain the "authentic swing" he once owned. In his commentary for Bamboozled, director Spike Lee criticized the symbolism of this film's title character, describing Bagger Vance as a peculiar angelic character who arrives in Savannah intent on helping affluent white people. Sadly, this criticism has some merit—Smith gives a strong performance, arguably the best in the film, but the symbolism is questionable. Also, the only other notable African-American characters in the film are drunks who socialize with Junuh during his alcoholic days. The issue is too complex to discuss at length here, but it warrants a cautionary mention. The Legend of Bagger Vance doesn't break any amazing new cinematic ground, but it does entertain. The performances are solid across the board, with a prominent screen debut by young J. Michael Montcrief. The material depends a little too much on cheesy meditation, and Junuh's problems never reach the level of compelling drama, but Redford's direction keeps the story moving, and the picturesque cinematography by Michael Ballhaus adds to the spiritual tone. The film's optimism is refreshing, but would have benefited from closer inspection of Junuh's depression. Overall, however, this is a surprising, interesting film, delivering much more than might be expected from its straightforward story. Image Transfer Review: This 1.85:1 anamorphic widescreen transfer stands up to the premier standard of other Dreamworks releases like Gladiator and Almost Famous. The black levels are solid, and the colors shine with life and energy. The pristine, green landscapes of the golf course and its rich surrounding waters look outstanding, supporting Redford's eye for naturalistic scenery, and the startingly clear picture exhibits no excessive grain or other defects. As Will Smith strolls along the Georgia beach, you can almost feel the sun bouncing off the sands into the blue sky. Audio Transfer Review: The Legend of Bagger Vance benefits from another Dreamworks staple, an impressive and detailed 6.1-channel DTS audio transfer. While the golfers achieve unbelievable shots, the roar of the crowd moves through the sound field with a "you are there" feeling, and the blasts in the World War I scenes explode from the speakers with devastating power. Although the story is driven primarily by dialogue, the touching score emanates nicely from the enveloping soundtrack. This transfer exemplifies the incredible depth available on DTS tracks given the proper treatment. An additional 5.1-channel Dolby Digital transfer also provides a nice sensory experience. It moves nicely through the sound field, but pales in comparison to the DTS transfer. This release also includes a decent 2.0-channel Dolby Surround track. Extras Review: The Legend of Bagger Vance features few significant extras, but it does include two brief featurettes and fairly extensive production notes. The most interesting supplement is Robert Redford: Insight Into the Legend of Bagger Vance, a four-minute slide-show with comments from the renowned director. Behind-the-scenes photos and images from the film complement his words nicely as he describes his thoughts on the story. The spiritual and nostalgic aspects of the story appealed to Redford, who seems to long for the simpler life of the 1920s; his remarks are brief but provide plenty of insight into this low-key film. It's unfortunate that Redford did not do a feature-length commentary, which could have been a compelling bonus. The other featurette is a three-and-a-half minute promotion piece that covers the basic aspects of the story. It includes short interviews with Redford and the major stars, but barely scratches the surface. The Production Notes section recycles the information in the keepcase insert, but it contains additional paragraphs concerning the real golfers and the actors' training. In the absence of a full-fledged documentary, these notes provide the disc's most in-depth information on this film. The cast and filmmaker biographies include background and filmographies (with character names listed) for six actors, and surprisingly substantial coverage of 12 crew members. This disc also includes a teaser trailer and the original theatrical trailer, both presented in 1.85:1 widescreen format. The Legend of Bagger Vance is surprisingly successful in making a meditative, introspective story believable despite its simple script. Golf, often trivialized and played for laughs on film, rarely receives this type of respectful treatment. Director Robert Redford uses the sport as a metaphor for the life and redemption of a broken young man.